How many vineyards are there? 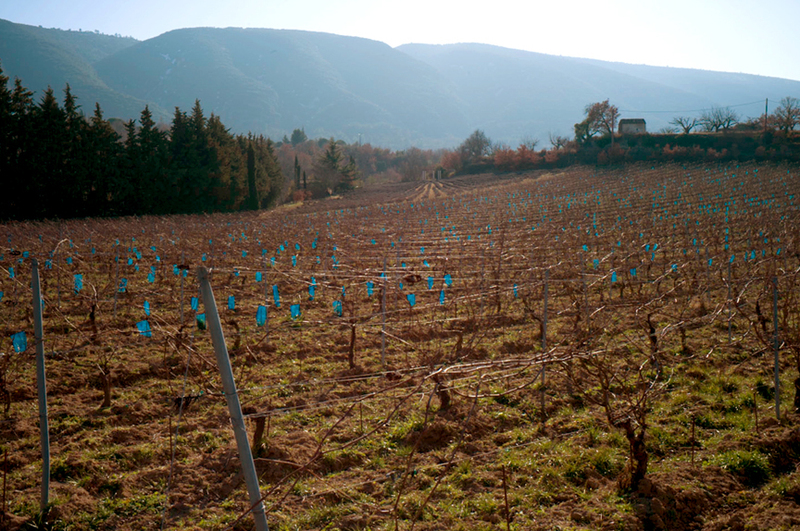 It seems as if every road in the Luberon Valley of Provence is laced with endless rows of vines, and they are all beautiful in their way, whether it’s their sheer commercial production beauty and organization, or older, pre-mechanization vineyards that have a different spacing for their mature vines. But every once in a while I come across one of these newer vineyards where the young plants have been collared with a plastic tube, something which sounds like it will only add an ugly note to the landscape, but which, at least here in this flat, but still backlit light, offered me something to stop and take a look at. I always trust my instinct when that tiny ‘Zen bell’ goes off in my head and says to me, “hey, what’s the hurry”. Stepping out into the space is always a moment to take a fresh look! What’s here? Why do these dumb plastic tubes call out to me so strongly? Perhaps it’s just the pure color note they bring to the earth tones and the new green, maybe its their relationship to the veiled and slightly blue haze on the hillsides, generating a kind of ugly beauty which makes a new harmony. Or perhaps its their repetition and the visual mathematics of scale, with the neon blue buzzing as it diminishes in size all the way back to the horizon. Whatever it is it tests the limits of what can make a photograph on any given day. So, on this day, this is the most memorable of my visions, and yet it is made of so little as to almost be without value. Yet I remember every sensation! This entry was posted in Provence and tagged France, Landscape, Provence, Vineyard on February 21, 2015 by joelmeyerowitz2014. “a kind of ugly beauty” – the most interesting kind! in small scale online viewing, the blue/teal plastics are not so glaring and the punctum for me is the vertical lanes towards the back, rows towards horizon, and above that an echo from a dip in the curves of background mountains. Beautiful shot. Love the writing as always.